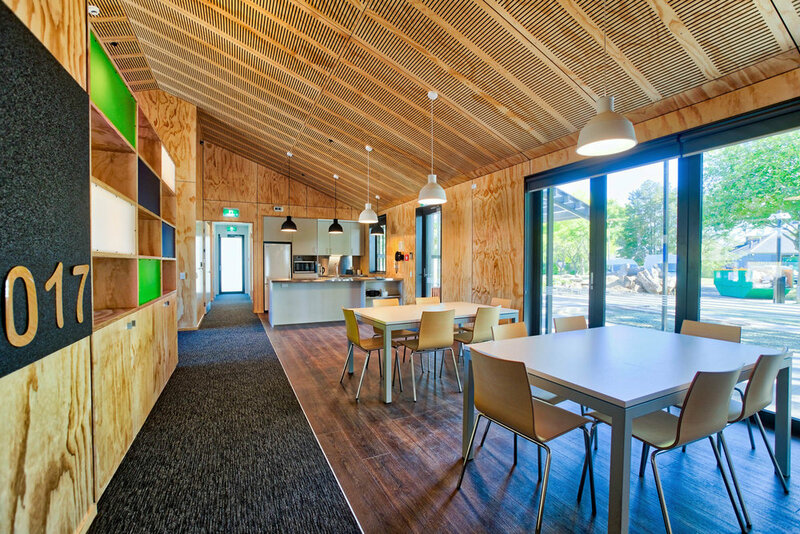 We are very pleased to announce the completion of our project Halswell Residential College in Christchurch, New Zealand. Lois Chick, ex-Board of Trustees Chair welcomed everyone to the opening and introduced the Honorable Nikki Kaye, Associate Minister of Education to officially open the four new Villas and Multi-Purpose Learning Building on a wet and windy day in April, however the rain did not dampen the spirit of the occasion. There was much warmth and joy at the mauri ceremony that included the return of the sod and the planting of a special tree as a symbol of the ‘life force’. The planting of the tree was undertaken by Honorable Nikki Kaye, Principal Janine Harrington and past student Scott Simons. Baldasso Cortese’s, Devkrishna Mistry ( Partner) together with William Noordanus (Director) and Tim Chaplin (Partner) from Baldasso Cortese Noordanus were joined by David Hobern and Margaret Waller from the Ministry of Education together with over 100 guests to celebrate the official opening of Stage 1 works. Stage 2, including the rebuild of the parent/carers accommodation is currently under construction and will see the completion of the masterplan.